Police in Kenya have seized 11 "miracle babies" for DNA tests after allegations of child trafficking. 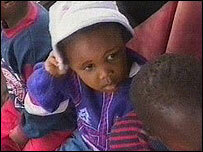 The children were picked up at the home of a couple who claim to be their parents in the capital, Nairobi. UK-based evangelical pastor Archbishop Gilbert Deya claims to be able to make post-menopausal or infertile women pregnant by exorcising their demons. But some children's charities say his actions are a front for baby trafficking. The children - all under the age of five - were arrested at the home of Michael and Eddah Odera. Mr Odera claims that his wife gave birth every four months after Mr Deya's wife prayed for them. ''These are miracle babies and God is doing his work. When God does his work no one can stop him,'' he told the BBC. Correspondents say Kenya's government was coming under increasing pressure to launch investigations into the claims. The Kenya Medical Association says the claims need to be fully investigated as they are ''contrary to proven scientific laws''. The Kenyan pastor and his wife claim to have got 13 children in a period of five years through ''prayers''.